It has been a while. We are back living the lives we left. I am in my advertising agency working on what advertising people work on. 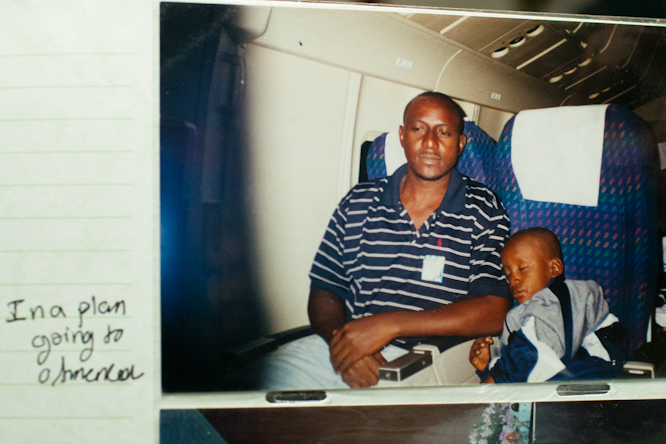 Aman is touring, flying across the world and writing incredible editorials. Life continues. There was a pause and in that pause we all met. It was only two to three weeks ago that we all were together. You were rooting for us, yelling at us, shaking your head, your fingers – your excitement and energy helped us continue. And now I sit in my cubicle wondering if we will speak again. Will we disagree again publicly? Will we continue to challenge each other? Will we try to understand those that are not like us? Does it all stop here? I take a bus and a train to work sometimes. 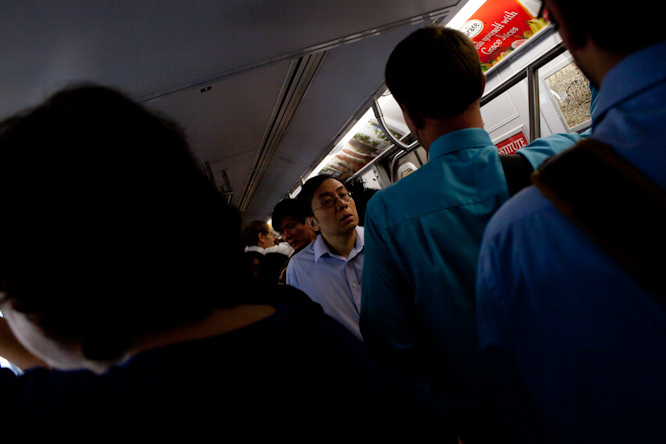 The morning commute isn’t a long one. I pass by the same homeless men and street vendors on my way into my office. My cubicle has my two mugs ready sitting with my made in Pakistan tea bags. After being gone for a month, everything sat there waiting for me. I brew my tea and I make my way from meetings to meetings. I eat during the day and sleep during the night. And as everything fades to normal, will I not wonder what all this has meant? I have these reoccurring flashes of Lutfullah Wali, the centurion from Nebraska, scribbling profusely on his wall. 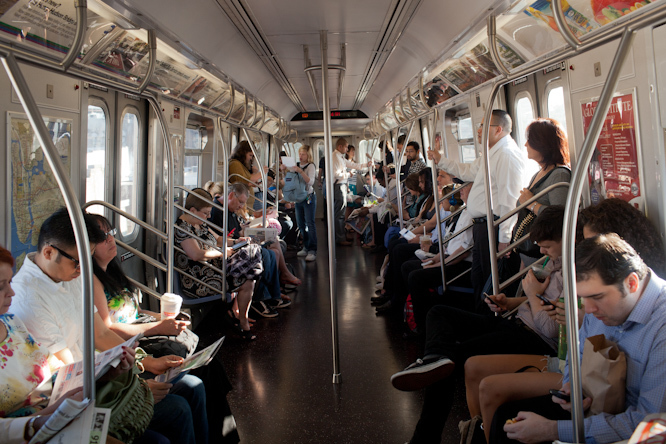 When I sit in the subway train on my morning commute, I sometimes wish the skyscrapers were replaced by the beautiful mountains of Denali National Park in Alaska or even the expansive cornfields of Indiana. But as the days pass, the road trip and it’s memories are starting to fade. And it worries me. The people, their hospitality, their candor, their plight – they cannot be forgotten. The spirit of what we started cannot die. We must remember them. That is how they will live on. The day of Eid, I drove from Burlington, Vermont to New York City. I made it just in time for the morning prayer of celebration at Masjid Ar Rahman. This is where it all started for Aman and I. 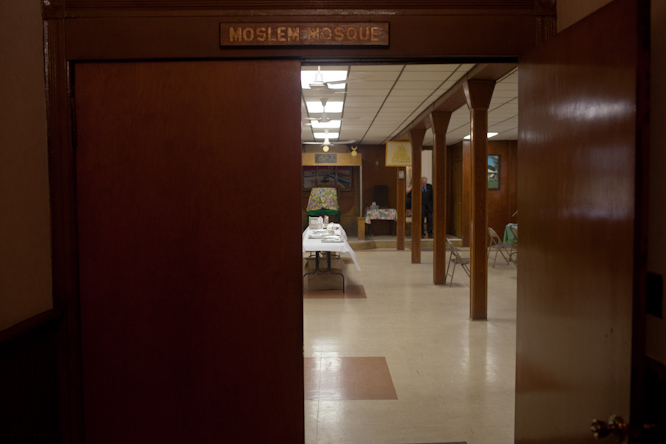 This is the place, where two Ramadan’s ago, we were so overwhelmed by the amount of Muslims and its diversity in New York City that we were compelled to visit a new community everyday. I felt like I had to pay my respects here. It made perfect sense in my mind to drive seven hours all night to make it to a five minute prayer and 20 minute sermon that was inaudible from the back of the prayer space. For the hopes of giving me some kind of clarity. In my mind, it was all worth it. 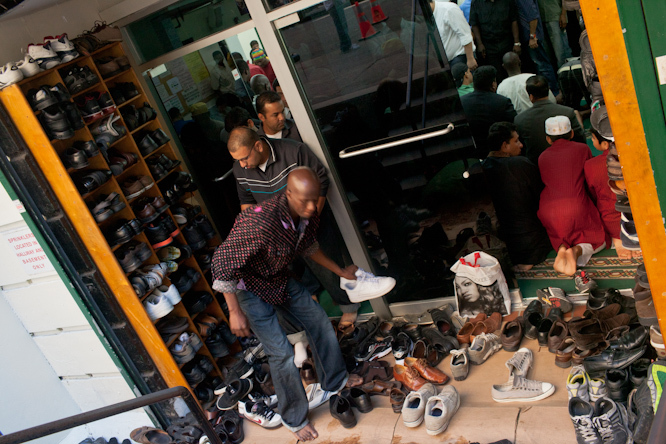 The following photos were taken during the Eid prayers at the storefront mosque, Masjid Ar Rahman. 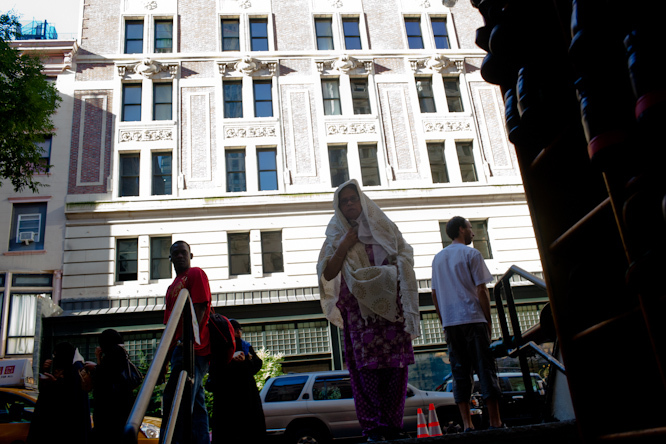 Masjid Ar Rahman is one of the busiest mosques in New York City. During the set prayer times, the roads are blocked by the yellow cabs that have illegally parked to make the prayer. 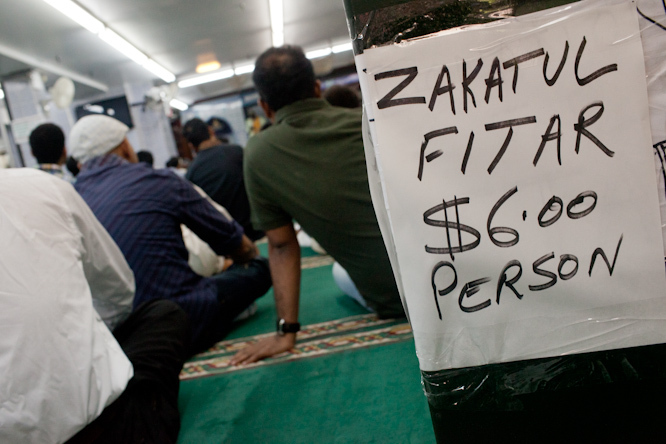 There is a certain amount that able Muslims must pay in charity before the start of the Eid prayers. It is a gesture of gratefulness. 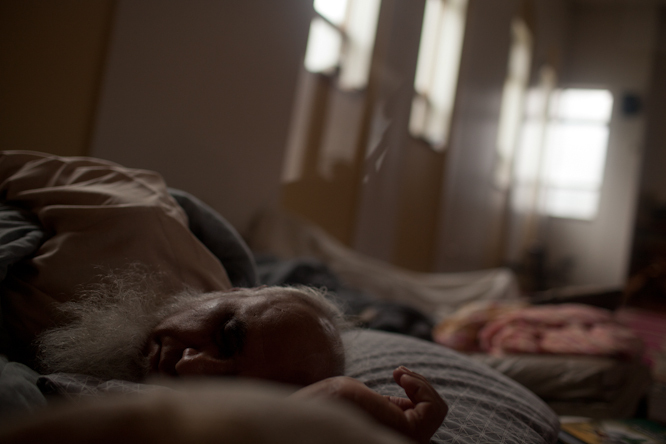 A beggar waits for the congregants to exit the mosque. 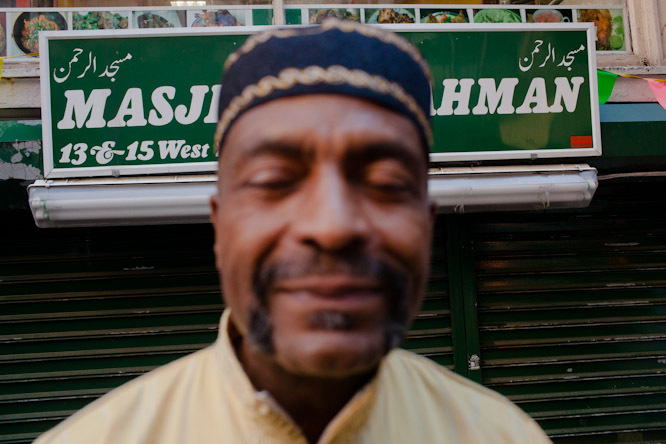 Outside of many large mosques in NYC there are designated beggars. 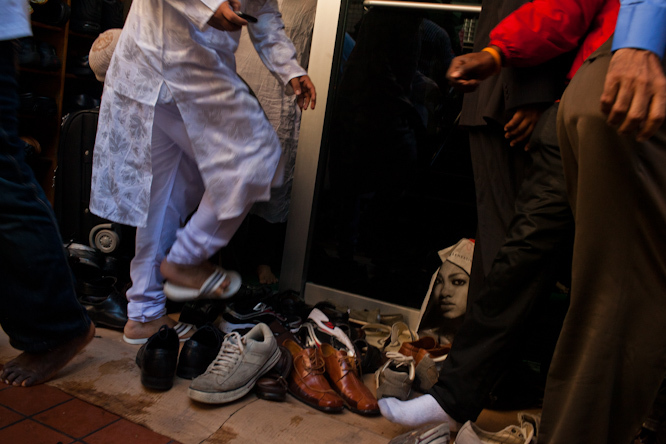 According to some Imams, they are part of a large network a la Slumdog Millionaire. The Imam, spiritual leader, embraces the congregants after the Eid prayer finishes. 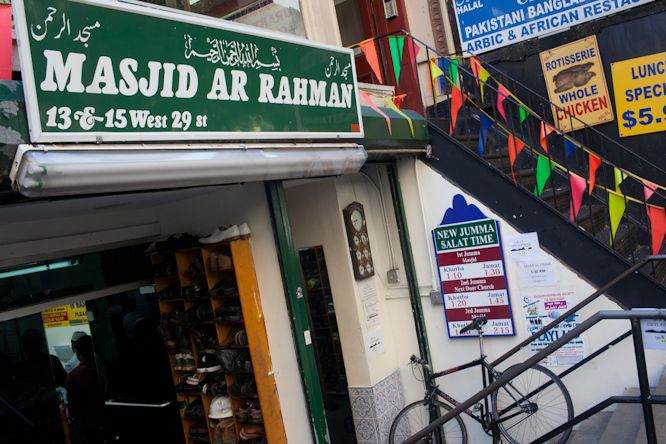 Since the majority of the congregation commutes, the mosque does not have an appointed Imam. 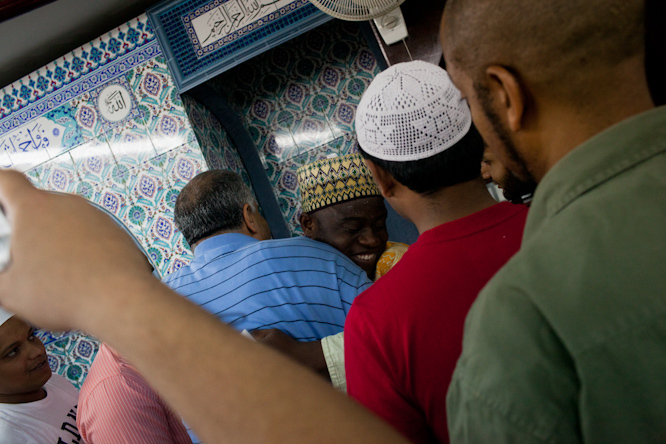 Though Eid is a religious holiday, many Muslims exited the mosque quickly to get back to work. These few men and women are descendants of Lithuanian/Polish Tatars. 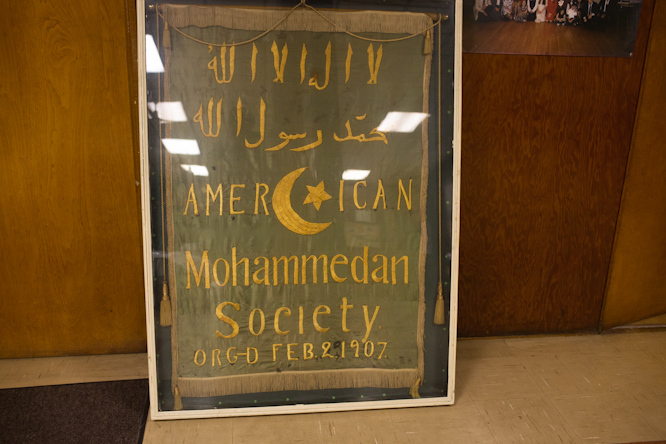 Their organization was established in 1907 and at the time they were known as Muhammadans. The original placard of the Tatar Muslims. 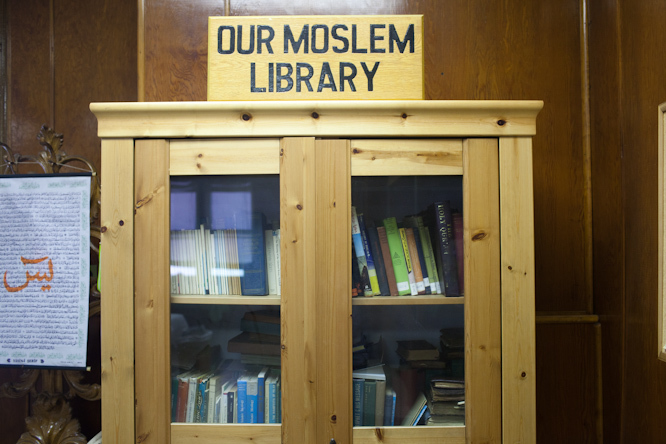 The community was first known as the Muslim Mosque and then later changed it to Moslem Mosque. They have kept it Moslem since 1957. The untouched table of treats. 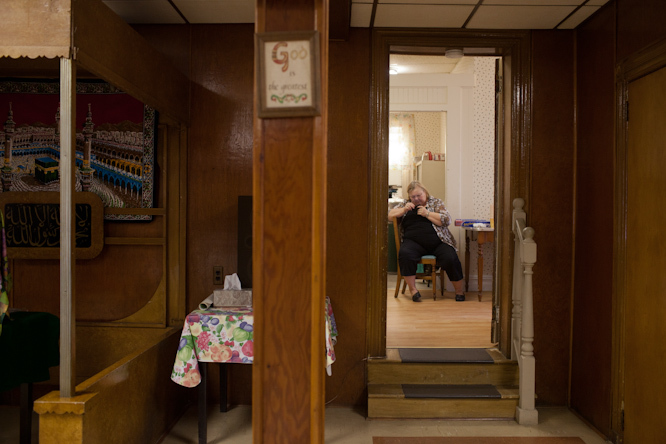 Marion, a community member, sits in the kitchen of the Moslem Mosque. 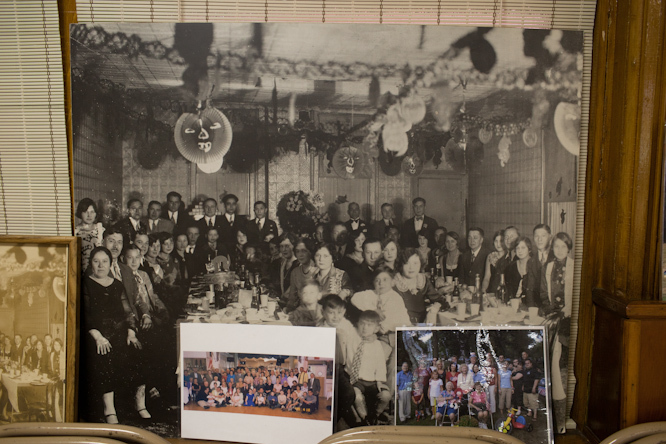 A photo from one of the first family parties of the Tatar Moslems. 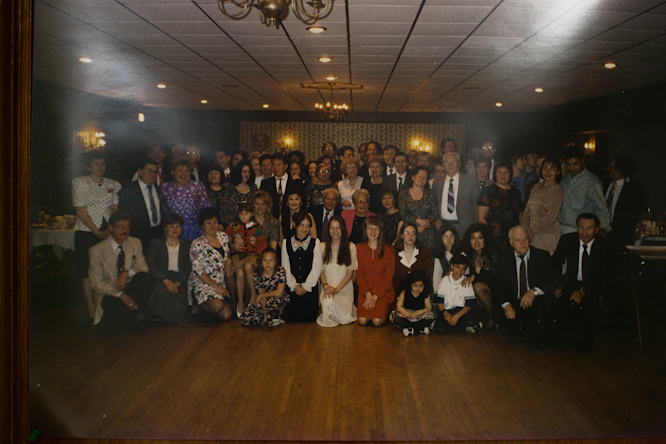 A recent photo of the Tatar families at a banquet dinner. 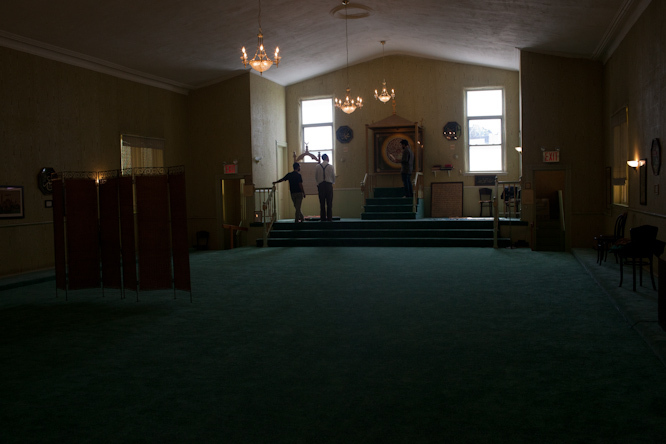 The upstairs prayer space is expansive and bright. The walls are plastered with Turkish artwork from the early 1900s. 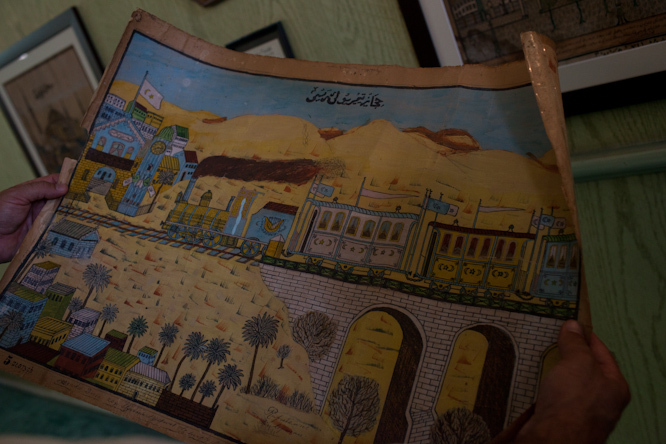 Jack, the vice president of Moslem Mosque, shares an original canvas Turkish painting. 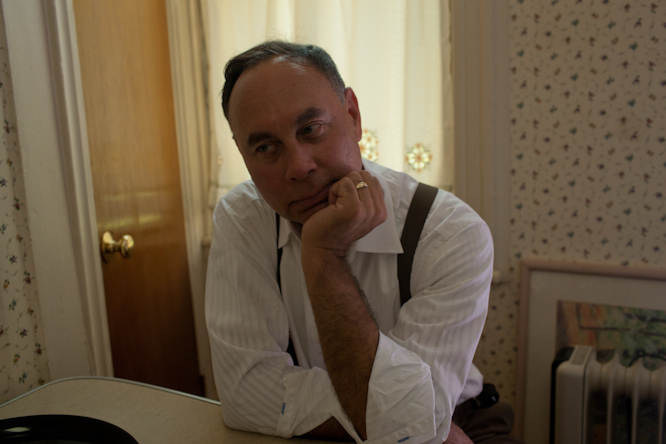 Jack sits in the kitchen with his wife Marion, not pictured. They are a small community and live amongst one another. They keep amongst themselves and are dwindling in numbers. We were their only guests that day. No one else had come for the celebration. Yes, I know. There are many questions about who these people are. There must be. I had many of them as well and instead of asking them, I had to leave to catch a flight to Texas. But is the connection for me and this congregation only seasonal? Is it similar in that way to the connection that you and I have? That we will only care to look at one another when we are hungry and bored? Or when there is a plate of food between us? As true as it might be, I can’t let myself believe that. There is something deeper that has brought us together: the stories. And perhaps that is how we will speak and stay connected. By sharing stories that mean something to us — stories that upset or uplift us. Stories of communities we would have never heard of before or cared to learn about. People that we never stopped to pay attention that we started to take note of. These are the stories that make up our life. They are the ones worth sharing, the ones we live for. Because what else are we without them? Poignant epilogue! Both you & Aman have given many of us wonderful, inspiring stories & new perspectives over these last 2 Ramadans. Masha’Allah. May Allah reward you both abundantly for opening doors to hearts & minds. Love you both for the sake of Allah. Looking forward to read, see, and hear more from the two of you. Insha’Allah. .
slm, in the article it said that some of the people have to go back to work after eid prayers? dont u get the day off from work? also i get what u say about the connection being seasonal, here in cape town we have the tradition that before magrieb we deliver samoosas/pies/cakes etc to our muslim neighbours. the rest of the yr we hardly spend as much time in each others kitchens or lives. Salam! Unfortunately, not all Muslims in North America can take the day off for Eid. Typically, a North American gets 15 vacation days a year, and not everyone can use one of them on Eid. Then there are some jobs where taking a day off when you want to is not quite possible. For example, while working as a teaching assistant here in Canada I once had to lead a discussion during Eid (I still got to attend the prayer, thank God). It was a question of either teaching this class or cancelling it, and the latter option would have been unfair to the students. So I went ahead and worked, and used the opportunity to tell my students about Eid. The food at that restaurant outside Masjid Ar Rahman is the bomb yo. Beautiful. What a shame that our short, albeit virtual, time together is smeared by temporariness and must end. May God bless you for your work, time, and efforts in showing us the human side to American Muslim life and may you achiever greater successes through it – especially for the people around you who need it most. Beggars in Brooklyn? Inexplicable. What are you all doing about it? nice pics. great work. great energy. in america you guys don’t have a day off on eid day ..?? Whatever you guys do next year for Ramadan or as part of another project, please follow up on this Williamsburg community. Great.,’Look at people while you are full so others will look at you when you are hungry and look at people while you are happy so you will not get bored.. Thank you so much for covering the New York Tatar community! I am originally from Belarus (I get my South Asian name from my Bangladeshi dad), and Belarus today is home to the largest portion of the Lithuanian-Belarusian-Polish Tatar community (for more info on them, see http://en.wikipedia.org/wiki/Lipka_Tatars , written from a Polish perspective; http://news.belta.by/en/news/society?id=647424 ; http://www.egypt.belembassy.org/eng/rb/edu/ under “Islam”). My Belarusian relatives aren’t Muslims and I’m not of Tatar descent myself, but I’m fascinated by the history of the Tatars of these three countries (see my article on the Belarusian Muslim community from three years ago here: http://www.eurozine.com/articles/2008-05-23-chowdhury-en.html ). And when I go back to Belarus, I pray at the mosque in Minsk that is operated by the Tatars there, and attended by them, along with recent immigrant communities and ethnic-Belarusian converts. I had heard that the Tatars of my part of the world used to have a mosque in New York, but I didn’t have any idea that it was still active. I have to check it out when I’m in New York! AsSalamu Alaikum, Rashed! I guess I was just too surprised to read a comment from a Muslim Belarusian living the States, so I had to comment I’d lived in New York for a while (and Ar Rahman mosque from the most recent post was the one i reverted at, actually), but I’m back in Belarus now. And..well, I have to say I still haven’t found a community here where I belong.. sadly. But anyhow, I pray at that Tatar mosque you are referring to as well. Wa’alaykum assalam, Rayyan! Wow, great to hear from you! So when you say “back in Belarus”, does that mean that you’re Belarusian yourself? Or are you an American living there? In either case, вельмі прыемна, браце! As for me, I actually live in Canada, but I did live in the US earlier for about five years (in Iowa and Washington, D.C.). Let’s exchange e-mail addresses; mine is chowdhuryrashed [at] gmail.com , and continue the conversation. Or you can find me on Facebook here: http://www.facebook.com/#!/chowdhuryrashed Looking forward to hearing from you! sorry, my name is kind of misleading, i’m actually a sister) and yeah, i am Belarusian. mslma [at] yandex.ru is my email. Here are a couple of videos from the Tatar community in Іўe, including one from this past Eid. I was in Belarus this past summer (2011) for a couple of weeks visiting my wife’s family in Grodno, where she is originally from. I am Turkish myself but have been in the States since the age of two. The story of the Lipka Tatars is a fascinating one, including the fact they used Arabic script to write in the Belarusian language. They are very well integrated in the societies where they live, to the point of having very high rates of assimilation. If you use google translate to translate the Russian wikipedia article about Islam in Belarus or the Polish wikipedia article about Islam in Poland, you will find quite few resources in those languages about Lipka Tatars. I have posted some links to videos I have watched on the internet about various Lipka Tatar communities. The images themselves are pretty interesting. Jazak Allah Khair for all the ttime you devoted to putting this together. Yesterday (Friday, July 12, 2013) I went to Masjid Ar Rahman in New York City (15 West, 29th Street) to offer Jummah Prayer for the first time, during break time of my work. I am so overwhelmed to attend Jummah in this mosque, which appears to me as a very diverse place for devotees from around the world. 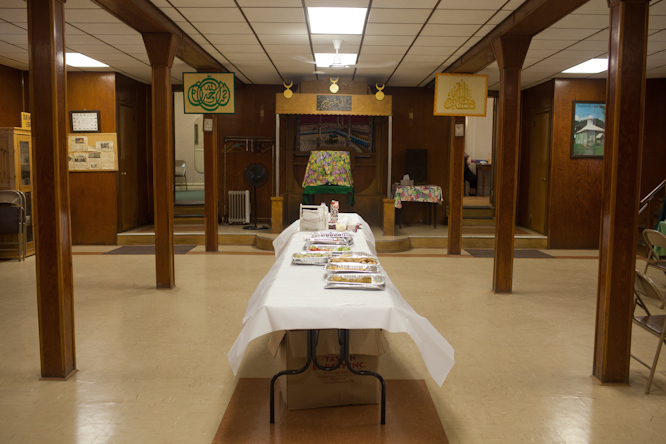 Races across the globe who lives in NYC attend prayers here and their gathering makes it a very pleasing sight. I wish to offer, at least, every Jummah prayer in this unique mosque from now on. The Khutba I listened yesterday was excellent, to say the least. The best way to do so is to keep them informed about the new developments.